When I'm sitting at Olive Garden (I confess - dining there is my guilty pleasure), I'll tell my husband that we have to save room for dessert. Always. And as I enjoy my meal, I'm anxiously awaiting for the tiramisu cake to end things on a sweet note. Well, that was then... and things have since changed. Having found this recipe for Classic Tiramisu from Cook's Illustrated, I highly doubt I'll ever order tiramisu from OG or any restaurant again! Tiramisu is an Italian cake consisting of espresso soaked ladyfinger cookies, layered with a creamy whipped topping of mascarpone cheese, whipped cream and egg yolks, topped with cocoa. In other words, this is a heavenly dessert, especially for those that love the subtle hint of coffee, the soft spongy texture of cake and a sweet, creamy filling to tie everything together. As easy as this dessert may be to describe, making it is a whole different ball game. Some recipes I've previously tried resulted in a cake that was too soggy, a creamy filling that was too runny and just overall, not very good. This recipe however restored my faith in making tiramisu at home because it was perfect! The cake maintained it's texture by not immersing the ladyfingers completely in the coffee/rum mixture.Instead, each ladyfinger is dropped into the coffee mixture so that it floated on the surface and then rolled over to moisten the other side. For the creamy filling, raw egg yolks are used (which resulted in a richer flavor I preferred over the cooked version) and are mixed with a balanced proportion of mascarpone cheese, sugar, salt and freshly whipped cream. Once everything is layered, the cake is dusted with cocoa (or you can top with grated chocolate shavings). This will definitely be part of my next Italian inspired dinner menu, but it seriously is great any time with any meal. Stir coffee, espresso, and 5 tablespoons rum in wide bowl or baking dish until espresso dissolves; set aside. In bowl of standing mixer fitted with whisk attachment, beat yolks at low speed until just combined. Add sugar and salt and beat at medium-high speed until pale yellow, 1 1/2 to 2 minutes, scraping down bowl with rubber spatula once or twice. Add remaining 4 tablespoons rum and beat at medium speed until just combined, 20 to 30 seconds; scrape bowl. Add mascarpone and beat at medium speed until no lumps remain, 30 to 45 seconds, scraping down bowl once or twice. Transfer mixture to large bowl and set aside. In now-empty mixer bowl (no need to clean bowl), beat cream at medium speed until frothy, 1 to 1 1/2 minutes. Increase speed to high and continue to beat until cream holds stiff peaks, 1 to 1 1/2 minutes longer. Using rubber spatula, fold one-third of whipped cream into mascarpone mixture to lighten, then gently fold in remaining whipped cream until no white streaks remain. Set mascarpone mixture aside. Working one at a time, drop half of ladyfingers into coffee mixture, roll, remove, and transfer to 13 by 9-inch glass or ceramic baking dish. (Do not submerge ladyfingers in coffee mixture; entire process should take no longer than 2 to 3 seconds for each cookie.) Arrange soaked cookies in single layer in baking dish, breaking or trimming ladyfingers as needed to fit neatly into dish. Spread half of mascarpone mixture over ladyfingers; use rubber spatula to spread mixture to sides and into corners of dish and smooth surface. Place 2 tablespoons cocoa in fine-mesh strainer and dust cocoa over mascarpone. Repeat dipping and arrangement of ladyfingers; spread remaining mascarpone mixture over ladyfingers and dust with remaining 1 1/2 tablespoons cocoa. Wipe edges of dish with dry paper towel. Cover with plastic wrap and refrigerate 6 to 24 hours. Sprinkle with grated chocolate, if using; cut into pieces and serve chilled. It looks delicious! I made tiramisu once... by the time I decided to make it, it was too late to go to the store. So, I made the ladyfingers at home! Your tiramisù looks perfect! I need to try out this recipe one day. Maybe it will convince me to like this dessert. 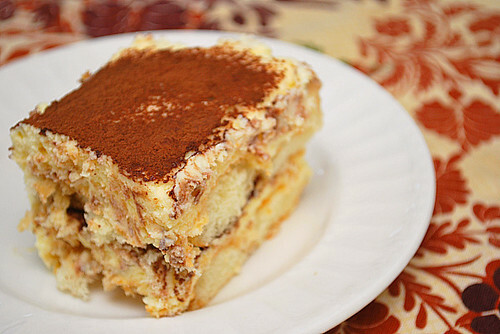 I think ALL Tiramisu is awesome and this one looks really rich and tasty! I have a recipe from an Italian friend that uses Savoiardi biscotti and has a Zabaglione that you pour over the top after you finish assembling it then topped with more fresh whipped cream. It takes a ten mile run to recover... but it's worth it! There is something about Tiramisu that makes it the perfect dessert. Maybe the ease to make it or the taste or both. Either way it is wonderful. I made this for my italian themed dinner and OMG it was heavenly. I'll never have to find another recipe again. I also subscribe to Cook's Illustrated so you know it's the best. Thanks. Your recipe rocks!! Since New Year's Day, it's been a non stop request for it! I think I've made it 10 times since then, but the one I made tonight, I mixed the lady fingers with some panettone. We'll see how the firehouse feels about that. Thanks! !